A 7:30am gathering at Smith Wilkes Hall main entrance is where a group of amateur/curious birders quietly mingle. An experienced local guide from either the Roger Tory Peterson Institute or the Audubon Community Nature Center leads the group thru different parts of the the grounds and woods. Bring your own binoculars or borrow a pair from our guides for the walk. About an hour in duration, the group will discreetly discuss our feathered friends who make their home here. Listen to their calls and note unique aspects of their habits and habitat. (Dogs are discouraged from this walk!) Seize the day - try something new! A diverse bird population calls western New York home. Scroll thru the gallery to see a sample of our many native birds. Many people attract Baltimore Orioles to their backyards with oriole feeders. Such feeders work best with jelly or jam, and are orange instead of red and have larger perches than hummingbird feeders. Baltimore orioles are also fond of halved oranges. If they discover a well-kept feeder, orioles lead their young there. It received its name from the resemblance of the male's colors to those on the coat-of-arms of Lord Baltimore. Northern Cardinals, in the family Cardinalidae, are passerine birds (with feet that are adapted to perching) found in North and South America. They are robust, seed-eating birds with strong bills.They are typically associated with open woodland. The sexes usually have distinctive appearances. The northern cardinal type species was named by colonists for the male's red crest, reminiscent of a Catholic cardinal's biretta. The American Goldfinch undergoes a molt (loss of feathers in preparation for new growth) in the spring and autumn. It is the only cardueline finch to undergo a molt twice a year. During the winter molt it sheds all its feathers; in the spring, it sheds all but the wing and tail feathers, which are dark brown in the female and black in the male. Jack Gulvin is the building superintendent for local bird condos, where the resident purple martins need not lift a claw. Every couple days, he lowers the condos from their high-up perch to change out their pine needle bedding. He discards harmful blow fly maggots and sprinkles a special powder to eliminate mites and fleas. He even installed a special compartment in the penthouse of the bird condo to catch house sparrows — an aggressive bird that likes to squat in purple martin nests — with a spring-loaded trap. It's a party at the Purple Martin House! Other than bluebirds, Gulvin said, purple martins are one of the only species to require that kind of pampering. The birds used to breed in woodpecker cavities and hollow spaces, but human development has largely cleared swamps and eliminated dead trees where purple martins take shelter. 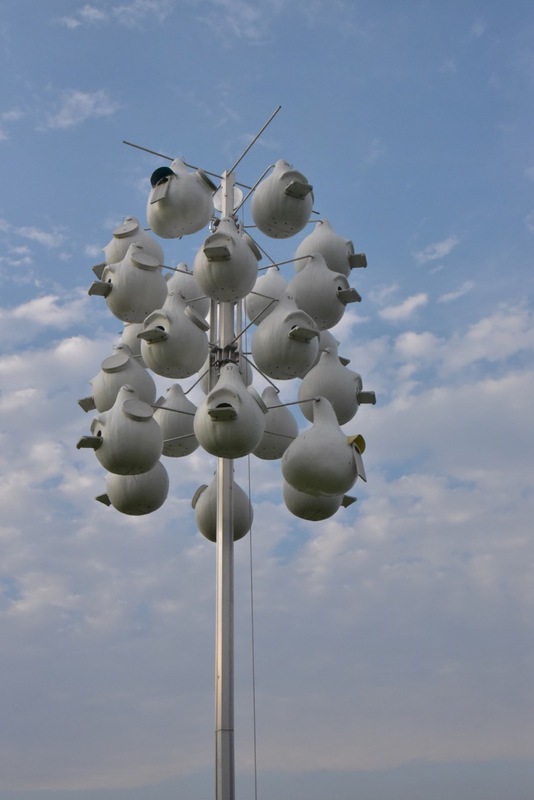 “They are now, in the major part of the range, wholly dependent on humans,” said Gulvin, who has cared for Chautauqua’s purple martin houses for more than 15 years. He will give the last Purple Martin Chat of the season at 4:15 p.m. Friday between the Miller Bell Tower and Sports Club. The combination of fast flying birds and camera gear can sometimes result in frustration. The following guide from Photzy.com is filled with practical advice about gear, set up, composition, for photographing birds. Check it out! BTG's friends at Cornell's Lab of Onithology offers this exciting bird resource/website - !MUST SEE! National Geographic hails 2018 as Year of the Bird honoring the centennial of the Migratory Bird Treaty Act, the most powerful and important bird-protection law ever passed. Bird lovers unite!